"Pathfinder", the new video from Italian symphonic death metallers FLESHGOD APOCALYPSE, can be seen below. Regarding the video shoot, the group stated: "It will definitely stand up from the average as we are going to shoot it in one of the most beautiful places in the world, Sicilia. This region was part of Greece right in the era where the 'Labyrinth Of Knossos' myth is collocated and our philological research led us there. It will be artistically deep and metaphorically intricate, a real reflection on the sense of our lives." "Pathfinder" is taken from FLESHGOD APOCALYPSE's latest album, "Labyrinth", which was released on August 16, 2013 in Europe and August 20, 2013 in North America via Nuclear Blast. The CD was mixed and mastered by Stefano "Saul" Morabito. The cover artwork was once again created by Colin Marks, who was also responsible for several neoclassical pieces of art in the massive inlay. The second teaser for "Pathfinder", the new video from Italian symphonic death metallers FLESHGOD APOCALYPSE, can be seen below. The full clip will be released on February 3. Regarding the video shoot, the group stated: "It will definitely stand up from the average as we are going to shoot it in one of the most beautiful places in the world, Sicilia. This region was part of Greece right in the era where the 'Labyrinth Of Knossos' myth is collocated and our philological research led us there. It will be artistically deep and metaphorically intricate, a real reflection on the sense of our lives." "Pathfinder" is taken from FLESHGOD APOCALYPSE's latest album, "Labyrinth", which was released on August 16, 2013 in Europe and August 20, 2013 in North America via Nuclear Blast. The CD was mixed and mastered by Stefano "Saul" Morabito. The cover artwork was once again created by Colin Marks, who was also responsible for several neoclassical pieces of art in the massive inlay. 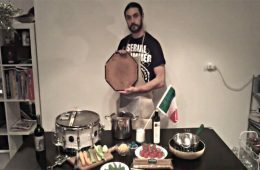 Italian symphonic death metallers FLESHGOD APOCALYPSE have posted a cooking video featuring their drummer, Francesco Paoli. 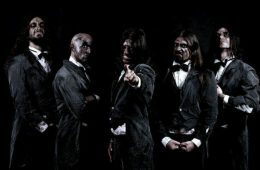 Check out the clip below and pick up some of the products used in the video at FleshgodApocalypse.com. Commented the band: "We are really proud to officially announce our last addition to our merchandise. "This is a completely different and pioneering idea driven by the great devotion and respect that we have for our country, Italy and our region, Umbria. "As Italians, we take much pride in our food and traditions, that's why we present our artisan 'pasta.' "This is a high-quality product, something that you hardly find in foreign countries stores. "We personally collected the most famous and delicious types to offer to FLESHGOD APOCALYPSE fans as another way to enjoy Italian art. "As for promotional campaign, and due to high shipping costs of these items, we decided to lower the prices for the next period in order to give the chance to everyone to enjoy these special products. "Here follows a little clip with our drummer Francesco Paoli showing how to cook it in the proper way." In other news, FLESHGOD APOCALYPSE is preparing to film a video for an as-yet-undisclosed song from the band's latest album, "Labyrinth". The group states: "It will definitely stand up from the average as we are going to shoot it in one of the most beautiful places in the world, Sicilia. This region was part of Greece right in the era where the 'Labyrinth Of Knossos' myth is collocated and our philological research led us there. 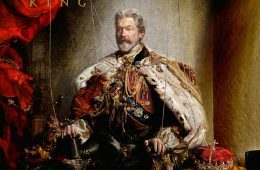 It will be artistically deep and metaphorically intricate, a real reflection on the sense of our lives. "Considering how big this matter is and how much we love our art, we decided to invest all the FLESHGOD APOCALYPSE pasta and wine profits in a big production video as well as in the future development of the band. "Last but not least, we will officially start the HUGE touring campaign in support of our new album, 'Labyrinth'. We will play all around the world, starting in Europe in January, continuing in Central America, Asia and Oceania in spring and coming back with an incredible tour in North America in the summer." "Labyrinth" was released on August 16, 2013 in Europe and August 20, 2013 in North America via Nuclear Blast. What better way to enjoy a fine blend of Italian metal than having a glass of wine to go along with it? Perugia and Rome-based brutal/symphonic five-piece FLESHGOD APOCALYPSE now has two different varieties of wine available. This exclusive offer is only available for European customers via the band's homepage. Both white wine and red wine lovers will enjoy this very unique kind of merchandise, as "Ariadne" and "Minotaur" cover the most popular kinds of Italian drinking culture. Stated the band: "We have spent a lot of time thinking about the best way to thank all our fans for the outstanding support we received throughout these years, a truly unique gift which could fully represent our Italian heritage and our strong connection with the Mediterranean culture. That's why we decided to choose two of the most typical blends of our area, grown in the most prestigious vineyards, to deliver you these two high-quality wines, inspired by the myth of the labyrinth of Knossos. Here's to you: 'Minotaur' and 'Ariadne'!" You can purchase the FLESHGOD APOCALYPSE wine at FleshgodApocalypse.com. FLESHGOD APOCALYPSE's latest album, "Labyrinth", was released on August 16 in Europe and August 20 in North America via Nuclear Blast Records. The CD was mixed and mastered by Stefano "Saul" Morabito. The cover artwork was once again created by Colin Marks, who was also responsible for several neoclassical pieces of art in the massive inlay. "Elegy", a brand new song from Italian symphonic death metallersFLESHGOD APOCALYPSE, can be streamed in the YouTUbe clip below. The track comes off the band's new album, "Labyrinth", which will be released on August 16 in Europe and August 20 in North America viaNuclear Blast Records. The CD was mixed and mastered by Stefano "Saul" Morabito. The cover artwork was once again created by Colin Marks, who was also responsible for several neoclassical pieces of art in the massive inlay. 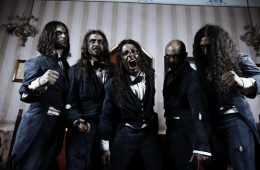 Comments FLESHGOD APOCALYPSE's Francesco Paoli: "'Labyrinth' is going to be THE album for FLESHGOD APOCALYPSE. It's the perfect combination of all our strong points with the best production we've ever had. It's definitely the most FLESHGOD thing we've ever thought with the most FLESHGOD riffs, lyrics, melodies, drumparts, solos, etc. We went deep inside the core of this music, we broke it, and we finally unleashed these eleven songs. 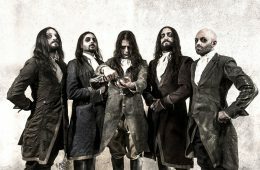 Italian symphonic death metallers FLESHGOD APOCALYPSE will release their new album, "Labyrinth", on August 16 in Europe and August 20 in North America via Nuclear Blast Records. The CD was mixed and mastered by Stefano "Saul" Morabito. The cover artwork was once again created by Colin Marks, who was also responsible for several neoclassical pieces of art in the massive inlay. Comments FLESHGOD APOCALYPSE's Francesco Paoli: "'Labyrinth' is going to be THE album for FLESHGOD APOCALYPSE. It's the perfect combination of all our strong points with the best production we've ever had. It's definitely the most FLESHGOD thing we've ever thought with the most FLESHGOD riffs, lyrics, melodies, drumparts, solos, etc. We went deep inside the core of this music, we broke it, and we finally unleashed these eleven songs.